Cleft lip and palate is one of the congenital disorders’ treatments we specialize in. 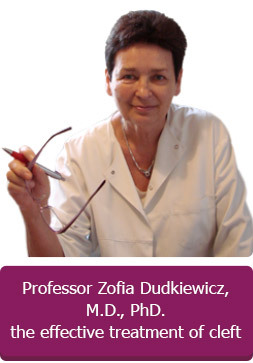 Zofia Dudkiewicz, M.D., Ph. D. Professor of Medicine, Head of Medicine in Formmed has developed an innovative treatment programme which enables early diagnosis, quick realization of correction procedures (before the patient reaches 3 years of age, in the period of infantile amnesia) and almost complete cure of the patient in pre-school age, which is of no small importance for his mentality and his further development. What is left to be done during school age is correct positioning of teeth with dental braces. A cleft is a fissure or opening. It is the non-fusion of the body’s natural structures that form before birth, usually between 6 and 12 week of foetal life, i.e. 2nd and 3rd month of pregnancy. A cleft may affect the lip, the palate or both the lip and the palate. The causes of the cleft have not been completely identified yet. It is said that there are genetic factors that contribute to cleft lip and palate formation, although the tendency to inherit this defect grows only when certain environmental circumstances occur such as: vitamin A, folic acid, pantothenic acid and nicotinic acid deficiency or vitamin A surplus, malnutrition, oxygen deficiency, corticosteroids (released due to a chronic stress), irradiation, decline of the volume of the amniotic fluid or viral infections. 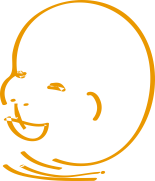 Approximately 1 in 500 to 700 children born in Europe have a cleft lip. Each year in Poland 800 children with that developmental disorder are born. The treatment of clefts is based on restoring the body’s natural structures and stimulation (with the help of a step-by-step rehabilitation) of the face muscles to further consonant development. Our team of doctors is able to exactly determine, which of the tissues require reconstruction and rehabilitation in order to restore their proper functioning. The professional care of the child is taken by a surgeon, orthodontist and speech therapist and if necessary by other specialist. The therapy of a child with cleft defect requires multiple procedures and takes time, but if carried out skilfully it enables complete healing. Remember: cleft lip and palate is not a life long problem of any kind! It is just as a stage of life which doesn’t have to determine it! This section was created in order to help concerned parents with children having congenital disorders. given by Professor Dudkiewicz to frequently asked questions. Multi-specialty care – what does it mean?